Any new engagement with an index of any archive, is an opportunity to forget previous behaviours of searching; learned strategies of following categorised and curated guide ropes leading into scenes of information. When sweeping up and down a catalogue index we should feel our searching to be pressured by the functions and alignments of archival systems. We could read an index differently, imaginatively, and release new figures of knowledge from the indolent content. When navigating a digital archive we activate algorithmic processes, where the assorted pattern matching of electronic data coincides with intellectual enquiry via search bar location methods. Each mode, the algorithmic and intuitive, overlooks the will and verve of the other. But how might we use the chaotic potential of digital data in adjacency to intuitive search impulses? Where searching is not so much strategically shaping architectured data, but wandering in its cosmos. 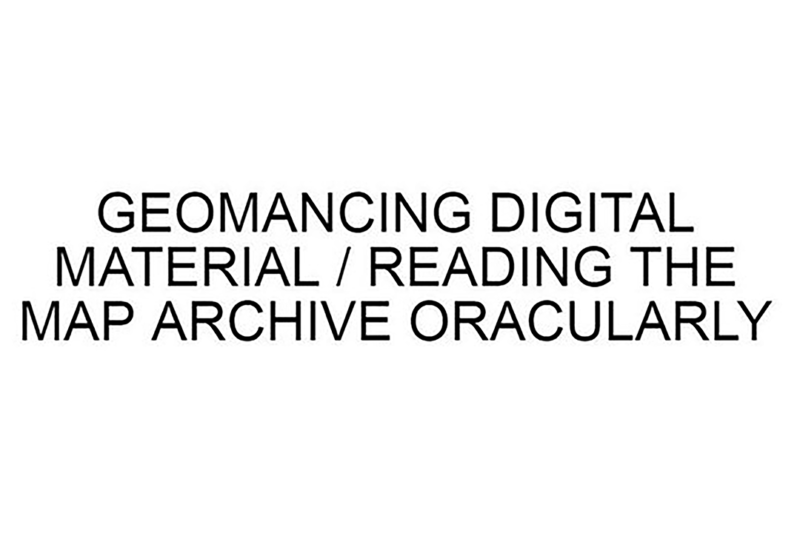 In other words, how might the noisy sea of digital data pertaining to any collection be part of a means to re-search and re-think the accumulated knowledge represented by this catalogue, giving way to a post-archive fantasy? How might we research differently? Look again. Could we search for material as if reading the system itself as a mystical constellation or as digital apophenia? To do so is to resist mining the matter for some conclusive object of research, and instead to fabulate connective narrative tissues into future contexts. (‘Future’ not as in progression from present in terms of knowledge production, but as alternatives to and radical otherings of presents.) As such the paraspace of an index is a potential methodology for experimental meaning-making and archive interpretation. This text is being written as part of a ‘season’ of writings. Each season is named and listed on MAP’s front page. The one I am speaking from (and I never do speak unrelated to timing) is called, Footnoting the Archive . This is first in a dropdown list that reaches back into history to more literal descriptions of seasons. The list reads like a composition and can be read romantically: Mountain Green / WILD RICHES / manners / words in your head, supple from swimming / Trailing Lobelia / Iodine of the Sea / Between Covers / Where is art and who put it there? / Do not lean out of the window / Winter 2012 / Autumn 2012. What are Seasons? Time-indexing the published, indicating the shifting contexts of climate, people, and ideas, reminding us that knowledge is configured to a time-moment. We might reconfigure how information is timed by drawing on the synonymic relationship between ‘season and ‘spell’, and so perform a magical correspondence that makes prophetic meaning. There is a partner to the list of seasons, a list of themes. This is much longer and organised by alphabet: Books… Cartoons… Design… Feminism… Football… Humour… Print… Review… Sexual… Politics… Zines… One can plot searches that coordinate each list, formulating information from the logic of concept + time. In this way the researcher might imagine epochs of thought and contingent styles of artistic production. A researcher can use the ‘Themes’ and ‘Seasons’ bar for mimetic triangulation. Or we can search for plots by way of researching by divination , a magical thinking that cultivates patterns and connections by way of experimental critique that uses the MAP archive’s politically articulated art theory and criticism for a geomancy of data. Why would you do this? The MAP archive seems to represent community-based knowledge production, formulations of commoning-ideas, speculations for creative materialisation. Its body of reviews represent a commitment to temporal reading, where to review artwork is to assess its access to the present. Then as archival material the review’s historical potency transforms into potential future meanings. To treat the archive as oracle, where the archive is “the question of the future itself, the question of a response, of a promise, and a responsibility for tomorrow”, means this care can feel more like a debt. But where past content represents future meaning we can permit ourselves to read with a clairvoyant faculty, activating inventive futures  and be released from the debt of the archive in order to be (ir)responsible with notions of its promise. Where the prefix ir negates responsibility and also represents the combination of a care for the continuing present with, Imaginary Realities. This practice relates to the practices of prophecy, those akin to William Blake’s prophetic poetries that transform voices of judgement and the instrumentalisation of knowledge into openness and inauguration. The prophetic reading of archives never seeks to be a voice of law, but to open up the enclosed system of the catalogue. To decipher the material prophetically calls to the temporality of the archive, where time extends from – beginning and ending from – each particle of archive data. In these forecast writings I’ll be geomancing the data as well as chasing the archive’s critical and creative feminisms as part of a radical projection of future knowledge and epistemological tactic. This tactic sees the researcher as experimental in relation to the material they are enchanted by. The oracular routes through archive noise as feminist epistemic formulations will divine from patterns in the themes (The Feminist Chorus – Feminism, Confessional) and the seasons; researching by reading a woman’s name that is there spelled out in letters, K-a-t-h-y-A-c-k-e-r, and spelt in a critical frame, and in a spell of time. How might she be there always in anticipation of the archive’s oracular voice? Holly Pester is a poet, writer and researcher. Hito Steyerl, ‘A Sea of Data: Apophenia and Pattern (Mis-)Recognition | E-Flux’ <http://www.e-flux.com/journal/a-sea-of-data-apophenia-and-pattern-mis-recognition/> [accessed 21 September 2016]. Walter Benjamin, ‘Doctrine of the Similar’, trans. by Knut Tarnowski, New German Review, 1979, 65–69. Robert Yerachmiel Snyderman, ‘Lyric Fermentation: A Practice’, from a talk given at Outside In/Inside Out Poetry Conference at Glasgow University October 2016. I am grateful to Robert for sharing his paper and for the fomenting ideas therein. Jacques Derrida, Archive Fever: A Freudian Impression (Chicago and London: University of Chicago Press, 1998). Trinh T. Minh-Ha, T. Minh-Ha Trinh and Minh Ha Trinh T, Woman, Native, Other: Writing Postcoloniality and Feminism, (Bloomington: Indiana University Press, 2009). Clare Colebrook, Blake, Deleuzian Aesthetics and the Digital (New York and London: Contiuum, 2012).